Islamabad – The flooding in Pakistan and U.S. relief efforts will not only be covered by traditional Pakistani media sources, but also through popular social media networking sites, “Facebook,” “Flickr,” and “Youtube.” Pakistan’s online media community and citizen reporters can also receive up-to-date information on U.S. flood relief efforts through the U.S. Embassy’s website ( islamabad.usembassy.gov) . Pakistan’s “Facebook” community can follow U.S. flood relief activities on the U.S. Embassy’s Facebook page, found at (http://www.facebook.com/pakistan.usembassy). The State Department “Youtube” website, (http://www.youtube.com/StateDepartment), will provide videos of speeches and of U.S. efforts to assist flood victims in Pakistan. U.S. relief efforts will also be covered via the Department of State’s “Flickr” page, at (http://www.flickr.com/photos/statephotos). Read the entire announcement here. You can follow its various social media outlets, but do not expect the updates to be current. The last update on its Facebook page as of this writing? August 6. Um, does up-to-date also means four days old? 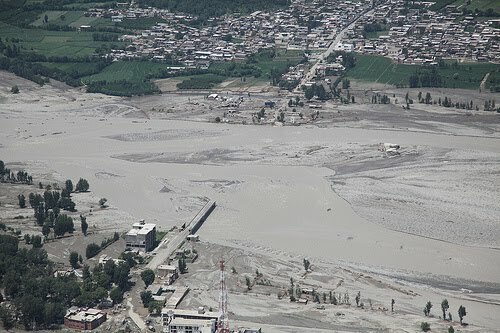 in the Khyber Pakhtunkhwa province of Pakistan Aug. 5, 2010.
in flood-stricken regions of the nation. Meanwhile, buried in the Latest Embassy News are the following items, mostly not published in its Facebook page. Granted that its Facebook page only has 2,130 fans at this time, but by not reposting the embassy’s disaster relief activities … well, I don’t know how this is different from the pre-social media days. Do I think this is a missed opportunity? For sure. But also hoping this is just growing pains. After all, US Mission Pakistan will soon have 22 public affairs officers. Some of those surely will be handling the new media portfolio. We’ll see … we’ll be watching ….